Whenever Ajit Balakrishnan is quoted in the press, it's usually in connection with wise pronouncements on information technology (IT) or higher education. But there had to be more to India's first internet entrepreneur than the sum of these quotes. 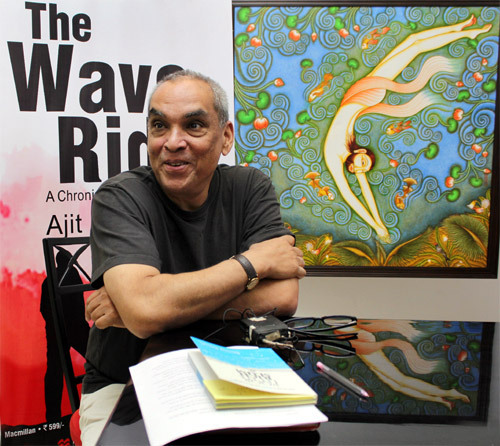 The publication of The Wave Rider, a semi-autobiographical "chronicle of the Information Age", provides a good reason to invite him to Lunch with BS, writes Kanika Datta. He had selected The Machan, the coffee shop at the Taj Mahal hotel on Mansingh Road, but experience has taught me that the noise levels there preclude sane conversation. There's Wasabi, the Japanese restaurant in the same hotel, I suggest hopefully, since it's a personal favourite, and he agrees. This meeting takes place a few weeks ahead of the official launch of The Wave Rider, which he says took all of eight months to write. "I am a very determined fellow," he tells me cheerfully when I express wonder at this speed, "I write from 2.30 to six in the morning," adding to my obvious query, "I go to sleep at nine at night  I am a very boring man!" True to his creed, however, the launch plan was going to be virtual. There was to be no gathering at a hotel involving a chat, question-and-answer session and cocktails and hors d'oeuvres to follow. The format would be the same but minus the socialising because it would be entirely online. "You have to live by your creed," he explains. "Besides, you draw in much larger audiences. If you have two or three well-done chats, you can pull in audiences of 100,000 to 200,000, so the scale is very different." The wine waiter appears. Balakrishnan requests Sake, but we're told it's only available by the flagon. I decline to share since I have to return to the office after this meal and am extremely wary of the effects of this deceptively potent Japanese rice wine. He sportingly agrees to a glass of red wine. This turns out to be a complex procedure; the waiter offers three bottles of wine to taste and choose. The first is a young wine so tart that I blench. Next, I ask? Balakrishnan is an interested observer. "This is the first time I have seen anyone return a bottle of wine," he says. Since I have never done so before either, I am embarrassed and hurriedly agree to the next one, a Malbec Bodega Norton (I forget to note the year), which turns out to be extremely drinkable. For the meal, we share two starters and no main course: rock shrimp tempura and an assorted sushi platter. The shrimp, wrapped in a delicate batter that looks easy to make but actually isn't, is unexceptionable, but my guest proves a poor eater. He is anxious that this interview be "more about my book than me" but I am keen to discuss the issue he deals with in his avatar as the chairman of the board of governors of Indian Institute of Management (IIM), Calcutta, of which he is an alumnus. What did he think of this recent rush to tie up with foreign universities? "Education has become a branch of the real estate business," he replies. "If I ask you to judge an institution, you'll look at the building and say it resembles an Ivy League institution, so it has to be a good college. So an unseen competition has developed among institutions to have better-looking buildings rather than focusing on pedagogy, which goes beyond faculty and teaching processes." Decentralised learning, he says, is the future, a point he has often discussed in his fortnightly column in Business Standard. In IIM Calcutta, for instance, Rs 20 crore of the Rs 100 crore revenues came from distance learning. On an annual basis, 5,000 students came out of the distance learning programme and 600 out of the institute. But what about the questions being raised about the value of an IIM education? "I am a product of the system and intimately involved in it. I think what they do, they do well," he answers elliptically. The broad point he makes is that entry is purely merit-based and an IIM education is valuable precisely because of this. "I keep pointing out that in a country in which virtually anything be bought, you cannot buy an IIM or an Indian Institute of Technology (IIT) seat." No pressure from politicians to admit this or that relative, I ask incredulously. He smiles. "The beauty of the system is that over time it has developed into a nice, obtuse structure, so that nobody can pressure you!" Balakrishnan's resume says he holds a BSc degree in physics, so I am curious to know why he went to IIM and not an IIT. Pure serendipity. "If you live in small-town India in 1969, you had no idea what an IIM might be; nobody in the family had been inside in a corporate set-up." The son and grandson of doctors in Kannur, Kerala, he says he was more interested in football than studies, playing at the university level as goalkeeper "because I was a tall kid". "One day, somebody said there's something called IIM, do you want to take a test? It coincided with a trip I was taking to Trivandrum to play in a match. I took the test in the morning, played the game and forgot about it. Then I got a letter saying I was one among 35,000 who had been chosen for IIM." The sushi is served and as the waiter grates fresh green ginger on to our plates, we're chatting about Rediffusion (now with the Dentsu Young and Rubicam name tagged to it), the ad agency co-founded with Diwan Arun Nanda and Mohammad Khan six months after he graduated from IIM (the name, he says, was "shamelessly copied" from a now defunct British radio station). At that time it was quite easy, he adds laughing, "Because all the ad agencies of that time took international ads with Indian models. We brought what we thought was a fantastic breakthrough idea that advertising must be creative. The first year we won all the awards in the Bombay ad club and by the second year, we were up and running." When he set up Rediff.com in 1996, I recall that many people didn't follow what he was up to because the internet was an unknown animal. How did he catch the wave so early? The beginnings are rooted in India's economic crisis. "Around 1989, things were collapsing all around us in our business. I was bewildered and thought, is it possible that I had spent my working life from 1971 like a frog in a well inside India? Things like import substitution, socialism, nationalism were like mother's milk to us but India was changing and we no longer knew how to distinguish the story from the truth. So I decided to clear the cobwebs and joined an executive programme at Harvard." There he recalls reading this "lovely case study on Compuserve, a pioneer in what was then called the information services business  and the founder's struggle to set up the company and how a new competitor called America Online emerged." He decided the business fascinated him but the general view at the time was that information services was not taking off because computer screens were too techie. When he learnt of attempts by the University of Illinois to create a browser  Mosaic  he "instantly knew it was a winner". How did he know? Because he had "played around with" the earlier version  yes, he replies, "I can write programming code, always could". So he told his partners, "Hey guys, stay there and I started rediff.com and wrote personal cheques for the next two years!" I comment that this book didn't say much about start-up pangs, unlike, say, Narayana Murthy's memoirs. "I wish I could relate some sorry tales of desperation but that was later. In 1971, the PC hadn't been invented. So it was a different world and I jumped into the PC industry. That was terrifying." That company, PSI, failed and "we lost so much money we had to sell the business" (to Groupe Bull of France). His book, he points out, does recount many acts of failure, the result of advice he received from a writing group he joined in America while his book was in progress. "They told me, write about things where you've failed not just about where you've succeeded." They were right, since, "modern innovation is the art of failing cheaply." Which allows me to raise the general opinion that Rediff.com had lost its steam; it was no longer among the top five internet properties and the stock doesn't do that well. Why didn't he sell? "Under no circumstances," comes the prompt reply. "I tell all my guys in the office to see this as running a marathon. The front runners are a million times our size. In a marathon, you don't run in front of the pack; you stay in the back and wait for your turn, otherwise you'll run out of steam." Since 99 per cent of the world's top programmers are in five square miles in California, you can't do much short of relocating. Why didn't he? "I thought of it but it proves nothing. It doesn't matter if your wealth rises $50 million doing it in California. The idea is to demonstrate that these things can be done here." So it's dil hai Hindustani I tease. "Not even remotely," he retorts, "I don't believe in India shining crap." But he sees the opportunity in a Schumpeterian future of creative destruction. "The next five or six industries are going to get demolished and rebuilt  first media, then health care, then justice. You'll see justice delivered by the afternoon, for example! That's the kind of thing that makes it so exciting." He warms to a subject that's clearly a current passion since he forgets all about eating and his wine glass is almost untouched. "Learning happens when some new bit of information attaches itself to something you already know, through a process of scaffolding. So the leading edge educators are putting a PC or an iPad in front of a young person and interactively discovering what level he's at and incrementally building or adding to the scaffolding so you can learn at your own pace. This scaffolding is the most important thing  I wish I could take a year off and just do that  that would be a breakthrough." But it wouldn't be a business proposition, I point out. "Who cares! Innovation and what it can do societally is much more important. I could have been allotted a coal mine and sold it and made a lot of money and been part of the coal scam. It's not worth it!" What's recorded here is a minuscule part of a conversation that ranges over: reservations in education (needed for a few more years), caste (he doesn't think about it and, like me, wonders why TCS' S Ramadorai mentions that he is a Brahmin in his memoirs; his own caste ("write that I am of peasant stock"), the government's role in IT (not for reporting), public sector delivery of health and education (believes in it) and what he does in his free time (has to think a bit). As I switch off my old-fashioned recorder, he gleefully declares he's going to write about my adherence to old world technology. Someone needs to design an app as comfortably reliable, I explain as we head out after a meal where I've done all the eating and drinking. India's top b-schools based on the alumni's job profiles!